Chris finds the time for travel! MOTOR mad Chris Hawes does not have to worry about crippling new-car depreciation – when it comes time to sell he can just wind the clock back to the day it was built, writes Steve Larner. The I.T. 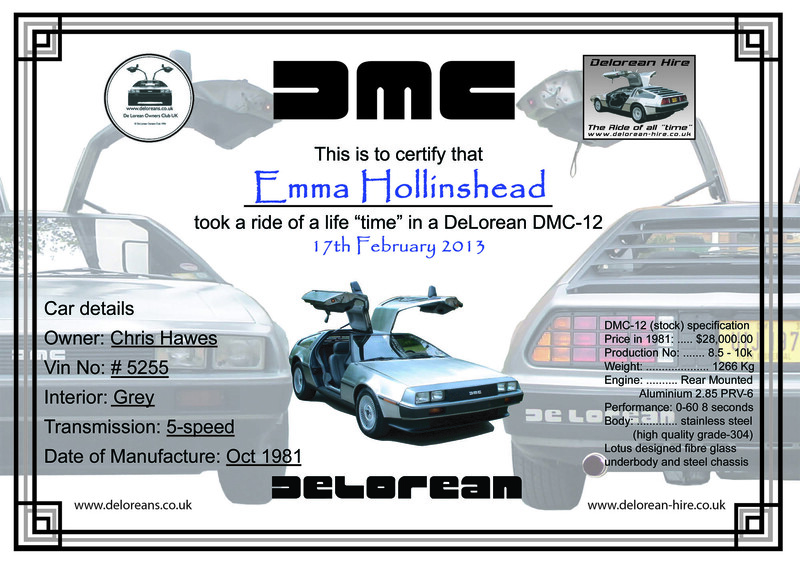 Consultant from Shenley Brook End drives an eye-catching DeLorean like the one in the time-travelling movie trilogy Back To The Future. "It is the same as the one in the movie with five speed gearbox, grey interior and pleated bonnet," he said this week – though his 1981 model does not have the 'flux capacitor' as fitted by the 'Prof' in the films to allow travel through time. Even without the cinematic connections the car with its gull-wing doors and brushed stainless steel bodywork the car is still a show-stopper. "Visits to the filling station can turn into epics," said Chris. "I bought it three years ago and have heard most of the quips – though someone asked me where Einstein the dog was the other day and I hadn't heard that one before," he said. The DeLorean was already a legend in the auto industry before Robert Zemeckis chose it as a star alongside Michael J Fox. Built in a factory in Northern Ireland constructed using millions of pounds of British taxpayers' money, it was the brainchild of American John DeLorean. Beset by technical, marketing and political troubles, just 10,000 were assembled with most going to the US – just as a fuel crisis arrived. Despite having a mongrel background with Cortina brakes at the front, Jaguar at the rear, a Renault engine and Lotus gearbox, the cars are still popular with enthusiasts. Three years after having his imported from the States, Chris’ is now insured for weddings and events. And with stainless body panels there are few cars that can be spruced up with kitchen sink cleaner! Milton Keynes Today 1st September 2005.